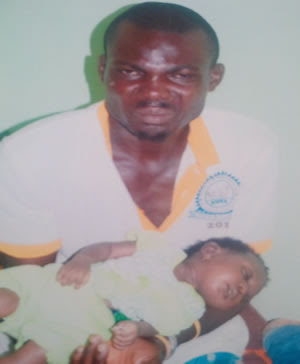 “The women were frying somethingLast Friday at about 7 am, Kazeem Olajide allegedly poisoned his 41-day-old baby,Zainab Olajide, in a desperate attempt to divorce his wife. The incident happened at Toluwalase Estate, Ijoko-Abule, in the Lemode area of Ogun State. The landlord of the house, who wanted to remain anonymous, said the suspect had denied being Zainab’s father prior to the incident. Sokunbi, the Oba of Ijoko-Lemode, said Kazeem owned up to the act, claiming that he was pushed by the devil. He said he had been following the case to ensure that the suspect was brought to justice. “It was the landlord who came to report the case to me and I directed my chiefs to bring him and the wife to the palace. I asked the husband and he confessed. He said it was the handiwork of the devil. The monarch added that Kazeem’s wife told him in the presence of his chiefs that she saw the bottle with him two days before the incident. The Ogun State Police Public Relations Officer, DSP Muyiwa Adejobi, confirmed that the case had been transferred to the command headquarters, adding that Zainab’s remains had been deposited in a mortuary. “The corpse of the baby has been deposited in a mortuary. The case has been transferred to the Department of Criminal Investigation for further investigation.